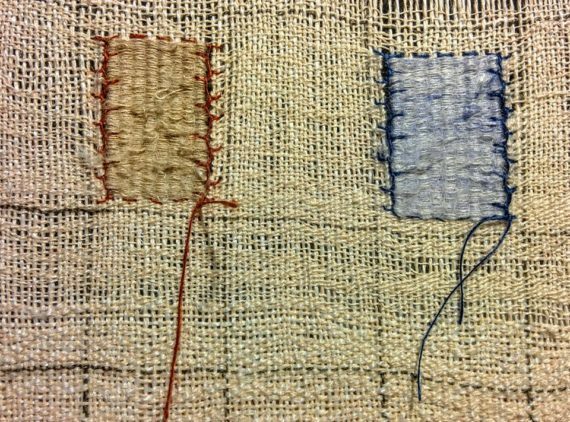 This blog accompanies my a-n Professional Development Bursary supported 'time out' from my 'bread-and-butter' textile teaching, and will become a record of my work as I 'move on' with my personal art practice. Thank you to a-n for awarding me with the professional development bursary that has given me the luxury to spend six funded days in my studio, free from my essential ‘bread-and-butter’ textile teaching work, that I do enjoy, but that allows little opportunity for sustained personal professional development. These studio days have enabled me to restore and set up my large floor loom which has been in storage for seven years and to spend some time sampling creative weaving techniques and considering the transference of my new knowledge and skills towards a new body of work and for incorporation into the teaching aspect of my art practice. It was so good to collect my large floor loom from storage and get it cleaned up, removing dust and cobwebs and sorting out the ‘sticky’ heddles and rusty bolts. 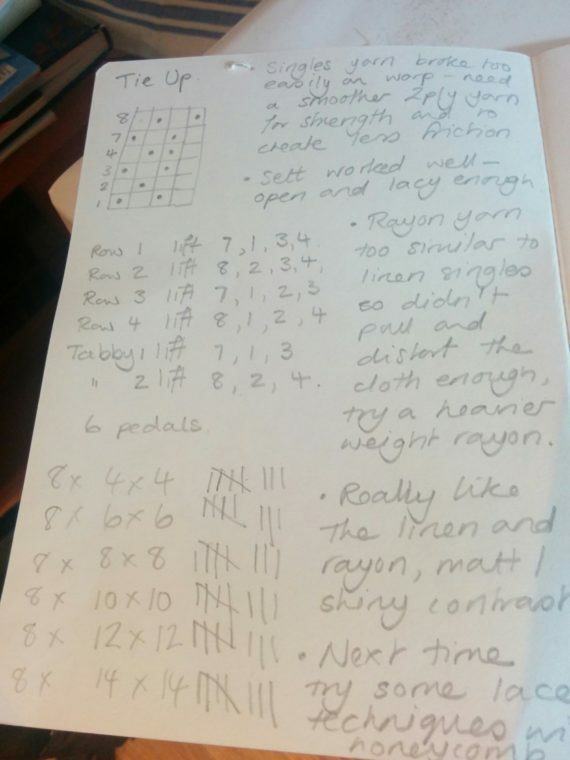 I also spent time in the first two days researching the set up and patterns that would give me the results that I was interested in achieving. 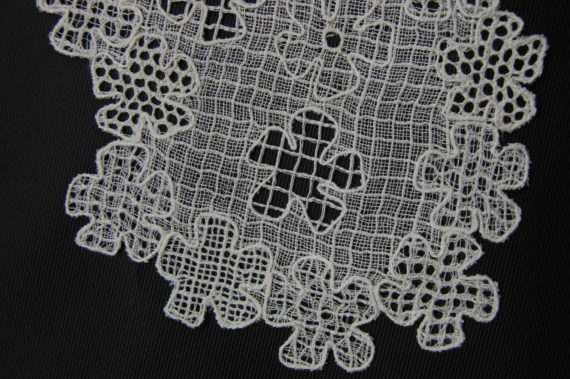 For sometime I have been interested in grids particularly in the paintings of Agens Martin and in the structure of antique lace. At the workshop with Susie Gillespie I had experimented with a grid created using a supplementary warp and was pleased with the results but now wanted to incorporate a grid within the initial loom set-up. I had seen some samples of honeycomb weave that uses a chequerboard of tabby weave and floats and the incorporation of an occasional heavier weft thread to develop a grid like pattern and I wanted to try this out to see what effects I could achieve. The next step was to work out the warp for my honeycomb weave sample. I wanted to sample different sized blocks of honeycomb and worked out the winding pattern for eight blocks each of 4 ends, 6 ends, 8 ends, 10 ends, 12 ends and 14 ends. These blocks would allow me to weave 4×4, 6×6, 8×8, 10×10, 12×12 and 14×14 and also all of the other combinations of number of warp to weft threads within the 4 to 14 range and eight bocks of each would sample sufficient cloth to fully see the effects created. I decided to use a 28/2 linen yarn for the selvedges and a 28lea linen singles for the body of the cloth. 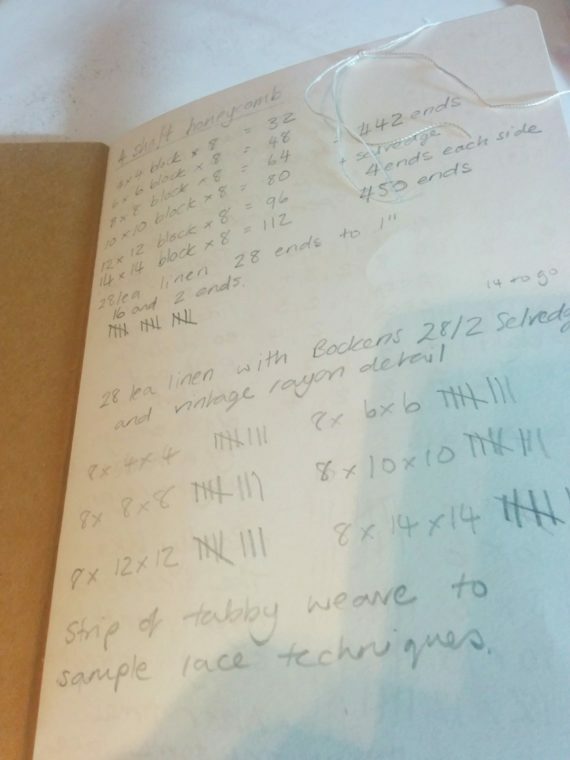 This resulted in a warp of 450 ends which took the rest of the day to wind. 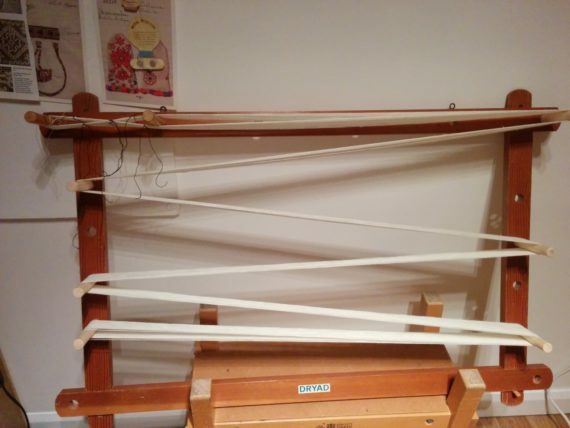 The next step was to dress the loom which took longer than planned, partly because there were 450 ends to sort out but also because I had forgotten that the raddle for this loom is in half inch settings and I had bundled my warp in one inch bundles (the setting for my table loom raddle). The linen singles yarn also proved to be difficult to seperate and wind onto the back beam because it was slubbly and the fibres knotted easily. This together with the number of warp ends that I had to replace during weaving because the singles yarn broke easily, has encouraged me to now research suppliers of a fine 2 ply yarn to work with in future. 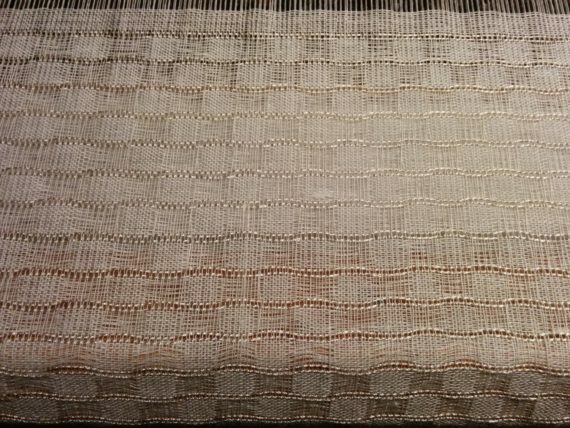 Once the loom was warped-up I was able to weave a full sample of the honeycomb pattern using the 28lea linen yarn for the weft with the incorporation of a vintage rayon crochet yarn for the heavier thread. I was very pleased with the resulting cloth and whist weaving and since have been considering how this can be developed further with the incorporation of more of the woven lace and creative hand manipulation techniques that I explored during the weaving workshop with Susie Gillespie. I was disappointed that I wasn’t able to develop more samples during the studio days but setting up the loom took longer than expected and I have learned a lot about suitability of yarns and also about a loom that I haven’t used for sometime. When I wound the warp and set it up on the loom I made it long enough to complete several samples and, now that it is on the loom it will be much easier for me to use an ‘odd half-hour’ to continue sampling. 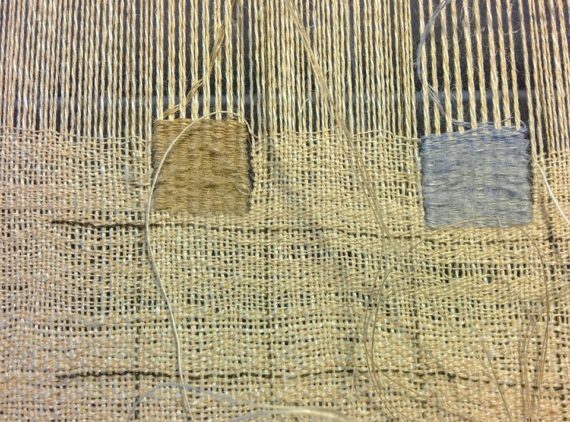 I am very excited by the new developments in my weaving practice that have been made possible through the award of the a-n professional development bursary, and I look forward to continuing sampling and then develop some new work for exhibition in 2018/2019. Autumn half term and a chance to take some ‘time out’ from the essential day-to-day preparation and teaching of textiles for adult education that I do find rewarding and that puts ‘food-on-the-table’, but that also leaves no time or energy for the development of my personal creative practice. 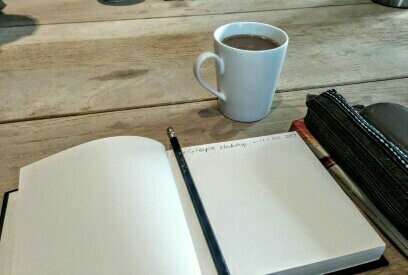 a-n have been very generous and have awarded me a professional bursary that will allow me to attend a creative weaving workshop with weave artist Susie Gillespie, and then spend six whole luxurious dedicated days in my studio continuing to develop and build upon the work undertaken during the workshop. On the first morning of the workshop I am one of six students who are all eager and ready to get started with some weaving. It was so lovely just to sit at a loom again and begin to work with the linen yarns. I was particularly looking forward to trying out some of the twisting, warp manipulated leno weave techniques that I had seen in Susie’s work but I also wanted to introduce an Agnes Martin inspired grid into my work, and, as Susie had already warped up the looms for us with a bleached linen yarn, I started by spending some time setting up a grey linen supplementary warp at approximately 2.5cm spacing across half of the warp on my loom. 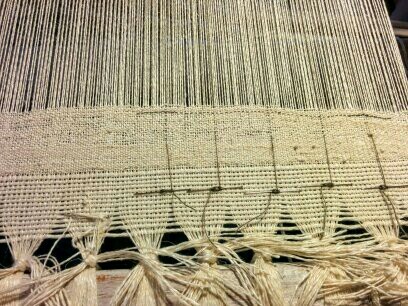 As I wove I then inserted a grey linen yarn with the weft thread across half of the warp in order to create the squares of a grid. 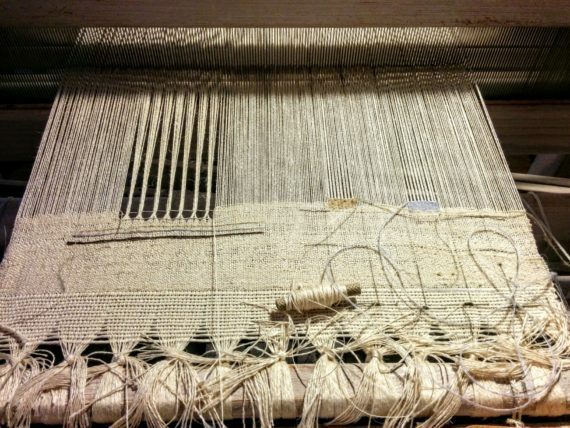 As I wove I explored a warp wrapping technique on the other half of the warp and worked three rows inserting different thicknesses of yarn between rows of weft threads. Susie then introduced a knotting technique that holds the weft threads in place before weaving a ‘twisted warp’ section and, on my sample, I ‘knotted-off’ a small section above the warp wrapped rows. 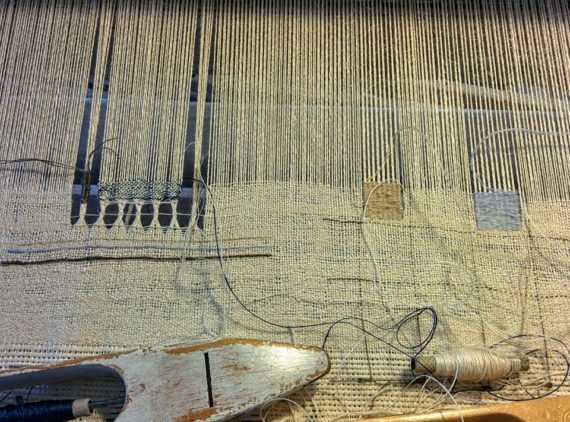 I continued to weave several rows on either side of this section before weaving a weft thread across the ‘knotted-off block’ twisting small bundles of warp threads as I wove. At the same time I began adding some tapestry weave sections into the ‘grid’ on the other half of the sample. A new day and a new problem to overcome – how to ‘knot-off’ the top of the ‘twisted warp’ section. After several attempts and then undoing the results because they didn’t quite work, I finally managed to ‘knot-off’ so that the twisted warp section worked as I wanted it. I then used a hand embroidery technique to create ‘woven bars’ above the twists of warp at each end of the twisted warp section and I used a woven insertion technique to introduce a colour into the block above the twisted warp section. I was now Working with six shuttles, two tapestry needles and two bundles and trying not to tie them all in knots. 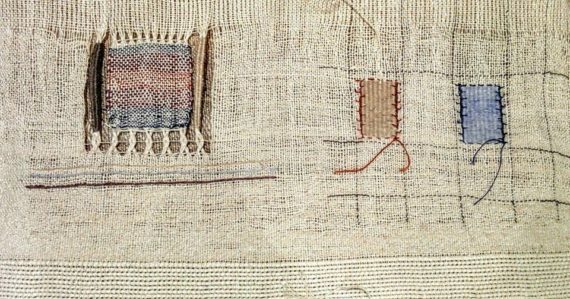 When I had completed the tapestry sections within the grid I used an insertion stitch to close up the tapestry slits that had formed on either side of each tapestry block. I completed the top of the colour block of woven insertion with another row of ‘knotting-off’ and then wove several plain rows so that I could take the sample off the loom. It was so lovely to be weaving and experimenting with weave again and I am looking forward to using some of the techniques again as I spend time sampling during my dedicated studio days. I am particularly keen to further explore the incorporation of supplementary warps and twisted warp techniques and, through the time spent at the workshop, have established that I need to spend some more time sampling to explore process.